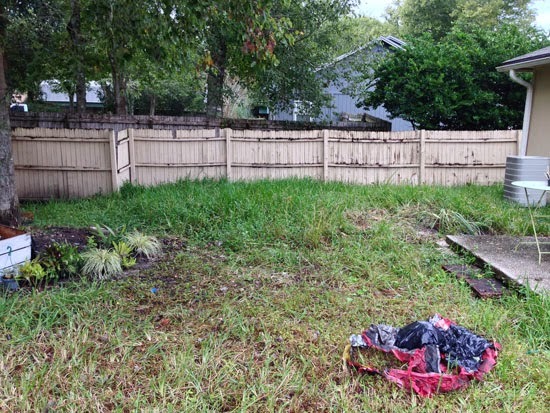 When we bought our house last year, I knew that the yard had issues; terrible erosion, poor drainage, dry shade and a doomed tree, to name a few. 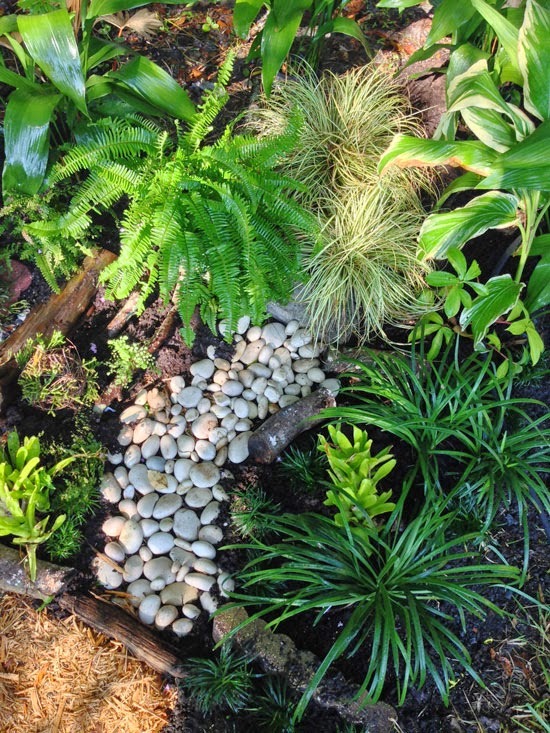 Yet for all of these problems, their solutions can make the garden into something more special; erosion can become an exciting dry creek bed and bad drainage can become a brimming rain garden. When you look at it like that, a perfect yard looks pretty boring after all. The garden had three big problems, but I had solutions for each one. Here's how I've tackled those challenges thus far. Erosion was the first problem. The yard is so badly eroded that the dirt beneath our patio was swept away (over a foot deep) and there was a big washed out gap between the bases of the trees and the patio. The whole right side of our yard (pictured) was essentially one big ditch.The remaining maple roots reached all the way to the patio and held the ground together, but prevented much from being planted there. My Solution was to build up beds along the edge of the eroded yard. By adding soil I've supported the patio and by adding lots of plants I've stabilized the bed and kept more dirt from washing away! The grass behind the bed is suffering from root competition with the maples, so I'll eventually turn this into a stream-lined path. Soon I will add more topsoil to the edge of the bed and create a dry-creek lined path between the bed and trees. This will create a dry place to walk and it will channel runoff from the swampy lawn to the shady rain garden in the corner. 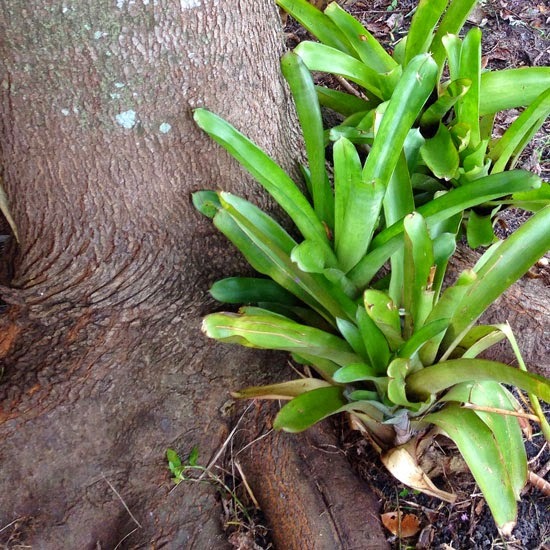 The erosion left snaking maple roots on the surface, but luckily bromeliads can still live there! Dry shade was the second problem. The three maples have a tangle of shallow roots that have been left exposed by the erosion, which means that there's little soil left for plants. 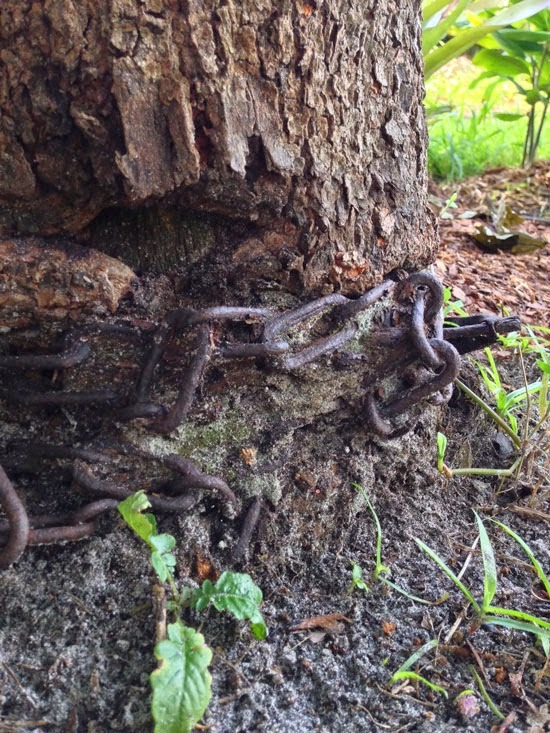 It's possible to add soil on top of a tree's roots, but you stand the risk of hurting the tree. 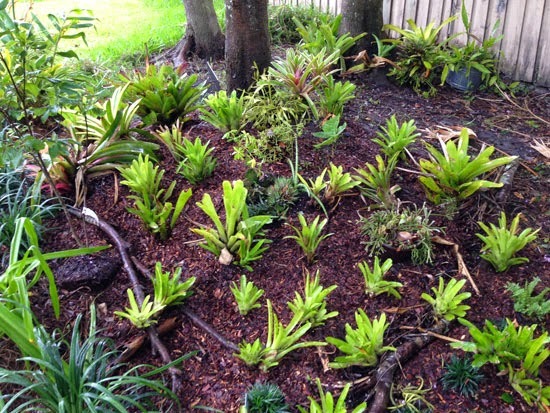 My Solution was to use plants that could handle the dry shade and lack of soil. 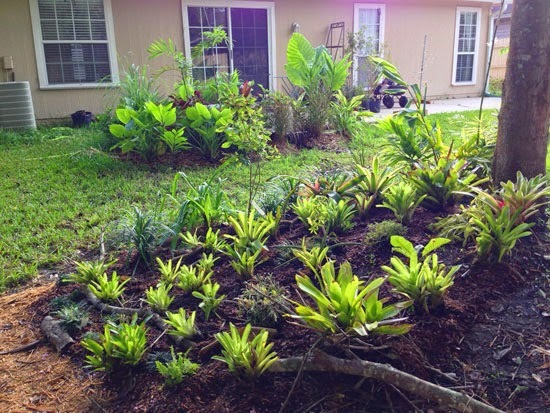 Here in zone 9a I can get away with planting cold hardy bromeliad species that absorb nutrients and water by collecting it in their cupped leaves. 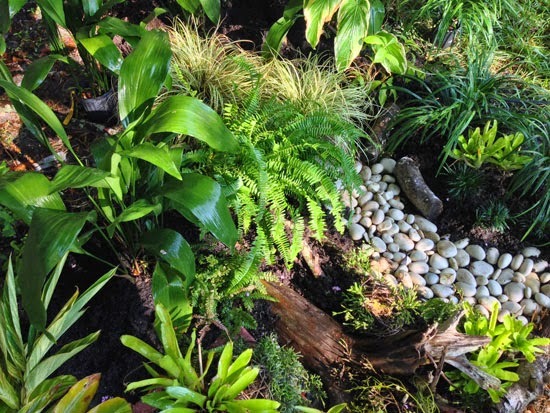 I've also used plants that those in more northerly climates might recognise, such as ferns, dwarf mondo grass, liriope and cast iron plant. 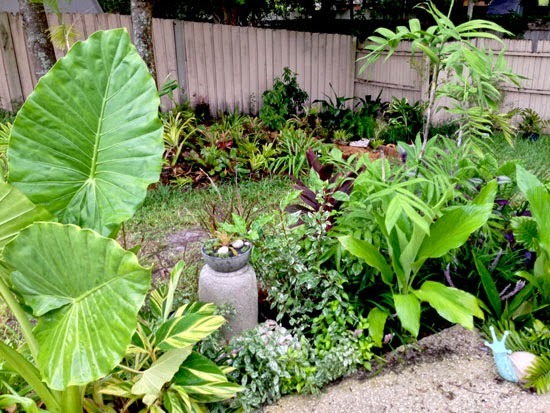 All of these plants can handle dry shade once established, and a few bags of pine bark mulch fines makes a perfect substrate while they get settled in. 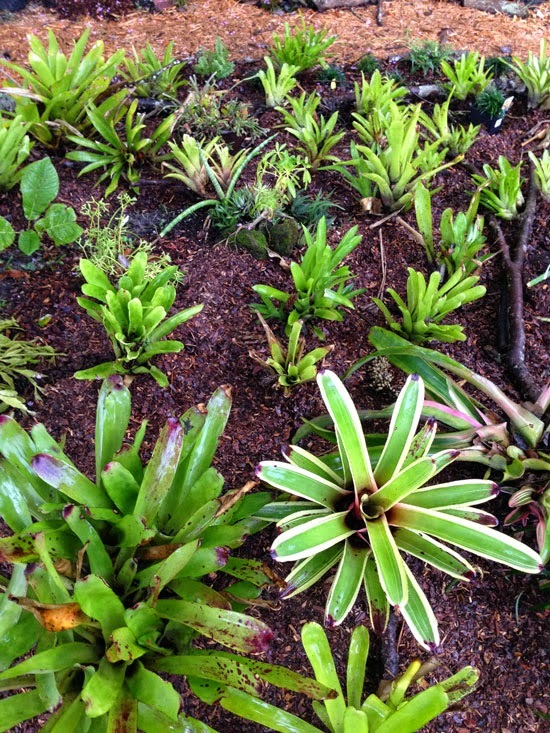 To cover more ground, I divided the bromeliads by twisting them apart at their bases. Poor drainage was the third problem, as you can see. 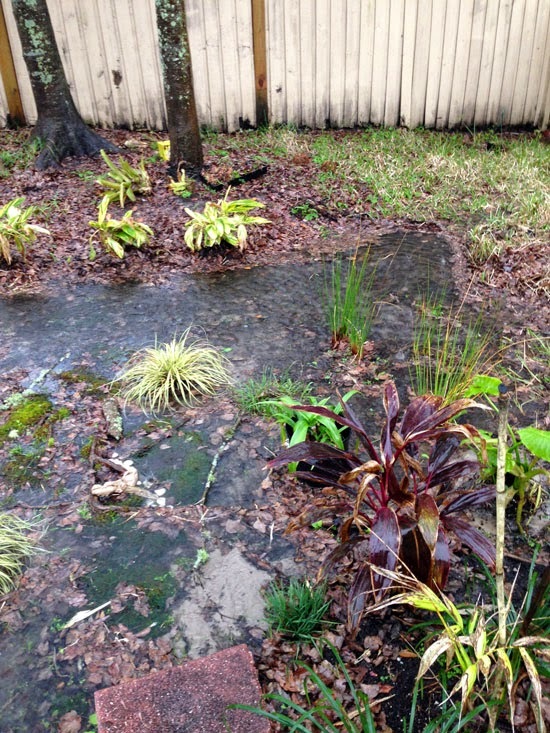 The left side of the yard is where I'll leave a lawn for my son, but that area is soggy after heavy rains and puddles persist across the whole yard for a few hours. Sometimes we even get a bit of flooding while the water makes its way to the storm drain behind our property, hence the photo above. 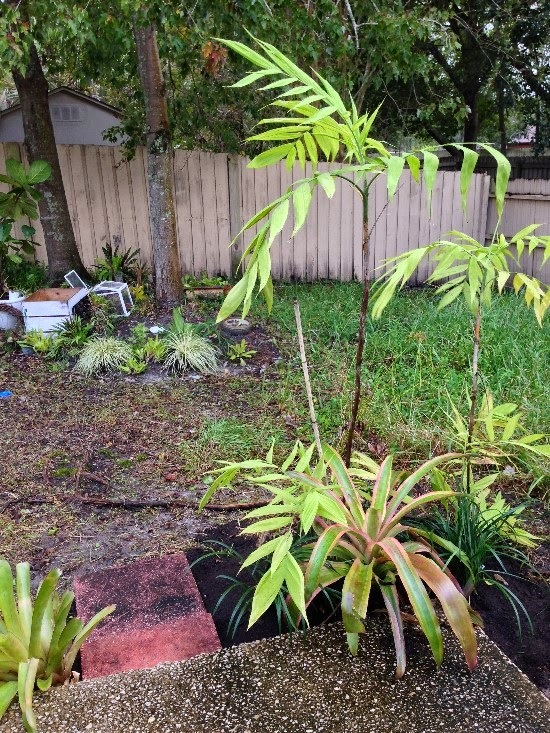 My Solution was to use plants that can handle wet soil and to clear a ditch so that water could drain to the storm drain out back. 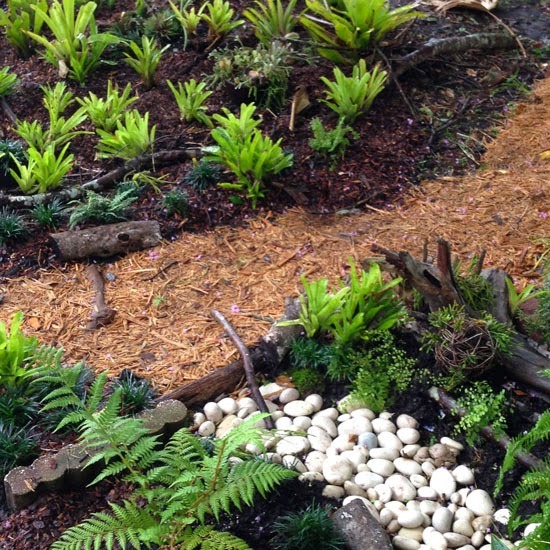 That ditch is now being converted into a dry creek bed and rain garden lined with moss, ferns and dwarf mondo grass, with sedges and gingers at the end to absorb water before it goes down the storm drain. 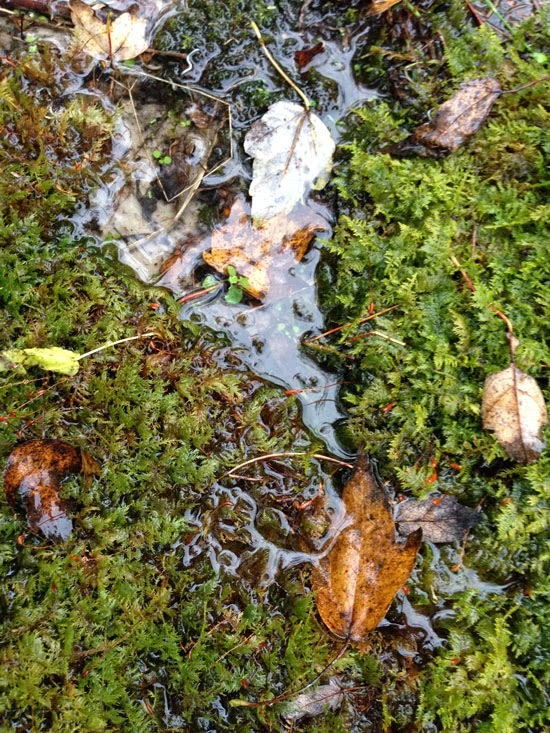 Part of the appeal is that it will whisk water away in style, but I have to admit that a big motivation was knowing that my kid and I would be able to sit outside on rainy days and listen to the frog songs amid the gurgle of a temporary brook. A tree stump will soon be my fourth problem. One of those three maples was strangled by a chain that the previous owners used to tie up dogs, so I knew that it was only a matter of time until it would have to be removed. I called a tree surgeon the other day and he'll remove it for a fair price, but it seemed a shame to take down a whole tree and have nothing to show for it. 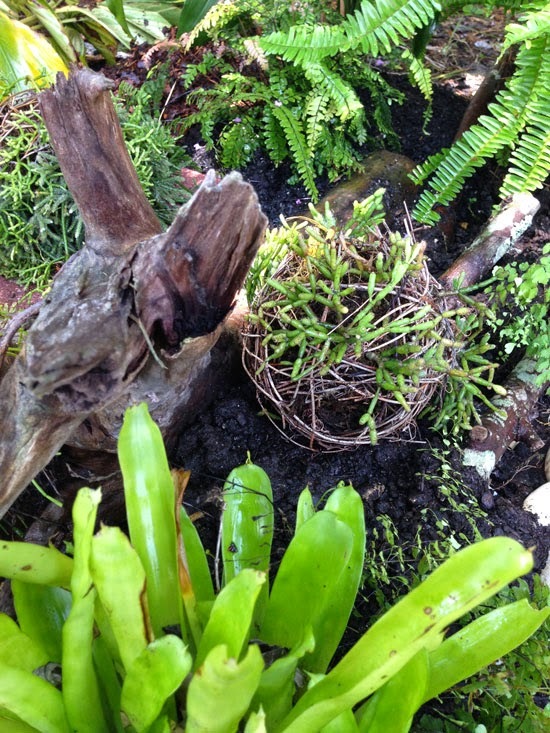 I asked him to leave a stump four feet tall so that I could festoon it with ferns and bromeliads, and he agreed that it was a cool idea. 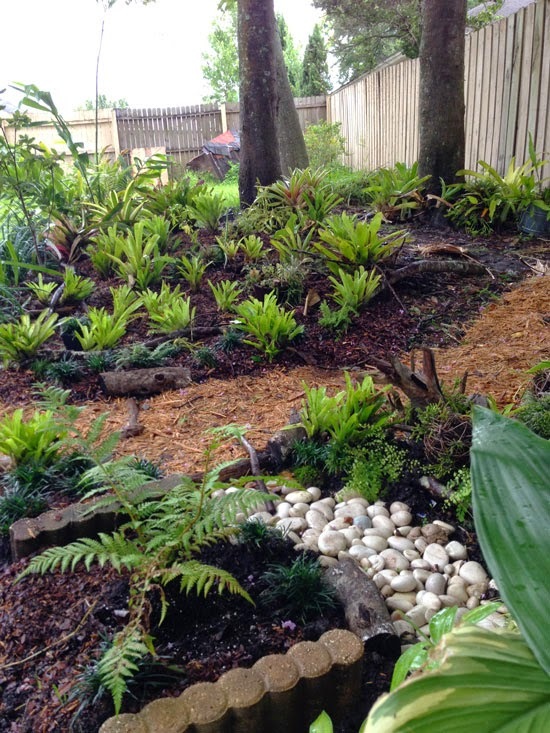 Hey, who else can say that they have a bromeliad tree and rainforest stream in their garden?